Highway construction has started losing the initial momentum with risk-averse PSU banks limiting lending to the sector. This threatens execution of dozens of road projects besides the government missing its FY19 target. “The issue of funding in the highway sector is a serious one. 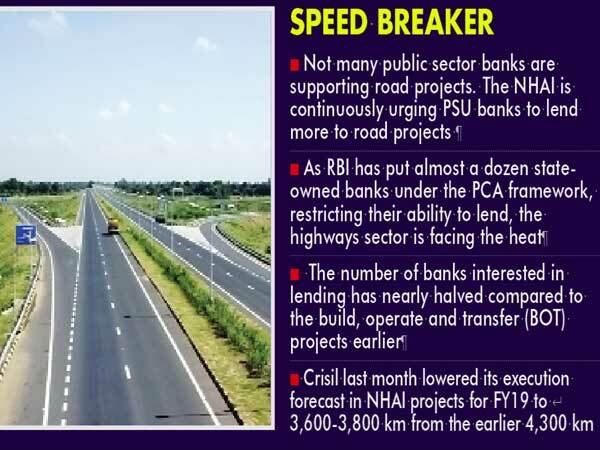 Not many public sector banks are supporting road projects. We are continuously urging PSU banks to lend more to road projects. The execution of road projects is happening, but not at desired speed,” a senior official at National Highways Authority of India (NHAI) told Financial Chronicle. As the Reserve Bank of India (RBI) has put almost a dozen state-owned banks under prompt corrective action (PCA) framework, restricting their ability to lend, the highways sector has been facing the heat. Given that PSU banks provide major chunk of the debt financing, there are apprehensions that many projects would miss their fund tie-up deadlines. Many banks remain apprehensive about the hybrid annuity model (HAM) and doubt developers’ ability to contribute their part of the equity in the projects. The number of banks interested in lending has nearly halved compared to build, operate and transfer (BOT) projects earlier. “In spite of all the efforts that the government has put in, including the fact that concession agreement was moderated, road construction pace is not at the level it was expected. A lot of projects are still languishing for the sake of financial closure done,” said Sandeep Upadhyay, MD (infrastructure), Centrum Capital. “There is no doubt, whatsoever, that the execution of various road projects would be affected. The authority has achieved very good target in terms of awards, but what is important is that these awards should translate into actual execution of work. My sense is it will have 20-25 per cent impact vis-à-vis the annual target,” he added. Research and rating firm Crisil last month lowered its execution forecast in NHAI projects for fiscal 2018-19 to 3,600-3,800 km from earlier anticipated 4,300 km. “We estimate around 800 km of execution is at risk this fiscal because many HAM projects are still awaiting appointed dates seven months after they were awarded,” it said. A delay in acquisition of land is also impacting the pace of the highways sector. Industry sources claim that in case of 60 per cent of projects, land acquisition has not completed. The main reasons for the delay are litigation and high costs. The bidding out of projects has also been affected. NHAI and road transport ministry together could award only 268 km of road projects in the first half of FY19. This is just 8.8 per cent of the target fixed. Crisil estimates execution could reach 9.9 to 10.4 km per day this fiscal, which is lower than the 11.8 km per day estimated, but better than last fiscal’s 8.4 km per day.